Ultimate Blends The Strength Restorer is tailor-made for fragile, damaged hair. The powerful blend enriched with Honey, Royal Jelly and bee Propolis, leaves fragile, damaged hair feeling healthier and more resilient from the first wash.
Use The Strength Restorer Shampoo for heavenly honey scented hair that feels stronger and looks healthier, wash after wash.
Best used in conjunction with The Strenth Restorer Conditioner, Balm and Serum for best results. Availabilty: From Clicks, Dis-Chem, Spar, Checkers and Pick n Pay stores. Garnier Ultimate Blends Colour Illuminator Shampoo blended with Moroccan Argan Oil and North American Cranberry extracts, leaves hair clean & feeling full of vitality. Use with the Ultimate Blends Colour Illuminator Conditioner to keep coloured hair looking vibrant and shiny, wash-after-wash.
For an added sheen, finish with our multi-tasking Ultimate Blends Marvellous Glow Oil with UV filter. Result: Coloured hair is nourished. Helps protect and illuminate shine. In case of contact with the eyes, rinse immediately. Helps protect and illuminate shine. This is a nicely packed shampoo, seals tight so no spilling if you travel with it. The first thing I really liked was the smell, you know when you open something and it smells expensive… this shampoo smelled as if I should be using it while travelling in Italy. Then I used it and I loved the nice foamy feeling. I like it when my shampoo makes enough bubbles, shinny. But the ultimate shampoo test is when your hair is dry, this one got 10/10 as my hair is shiny and soft and clean and that is it’s job right. It is a nice family shampoo as my whole household uses it. Just like the conditioner it is soft and gentle enough for evryday use and for children’s hair. I have been struggling for years to find a shampoo that not only cleanses but soften my hair as well. The shampoos I have tried before all left my hair my hair dry and hard, but this… This is really nice. I love the smell too, I would definitely recommend this. 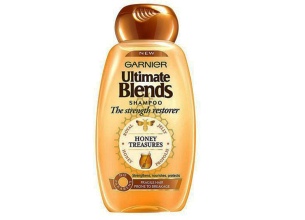 Garnier Ultimate blends shampoo gives salon quality results at a fraction of the price. Hair is silky smooth, shiny, nourished and smells divine. A must-have product for color-treated hair! • Tailor-made for fragile, damaged hair. • Powerful Blend enriched with Honey, Royal Jelly and bee Propolis, leaves fragile, damaged hair feeling healthier and more resilient from the first wash.
• The smell is simply divine!!!!! My hair still smells great several days after use! • Love the fact that it comes in 200 and 400ml bottles. Just hoping the 400ml will be a real saving and not as with other shampoos almost the same price as 2 x bottles 200ml. • I am still trying to find some, as my hair is wavy, dry and damaged and this shampoo just made it feel and look great!